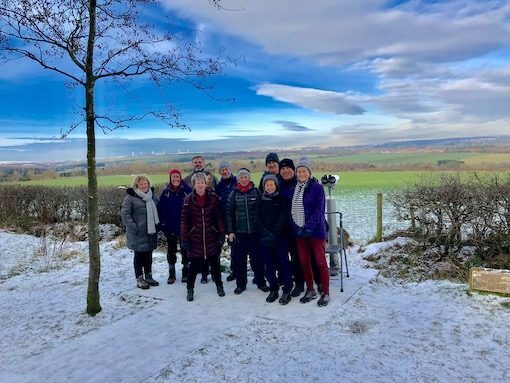 A bright sunny morning with doubtful riding conditions meant that a walk was called for so fourteen of us gathered for an undecided coffee stop. We walked through footpaths to the top of Whinney Lane including the rerouted footpath through Ashville car park. Martin pointed out the potential route that could be a cycle route to the back of Covance if anyone from NYCC was listening! 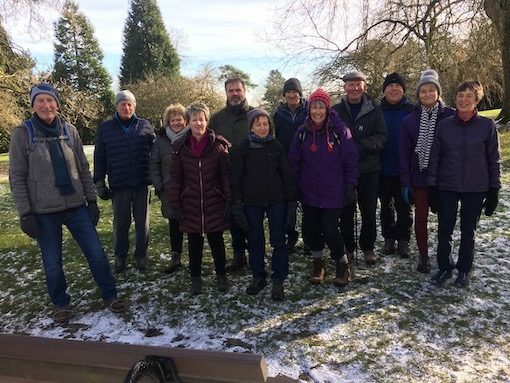 Others pointed out the alternative routes that would have picked up the Ringway route, so we know that there are a great variety of walks for these non cycling days. The icy chill was still in the air, despite the forecast predicting it it was going to be around four degrees today. A few WE members had gathered to go walking, Dennis arrived on his cycle, what a hero, though he promptly set off back home. Four intrepid cyclist led by Mike W, followed by Liz F, Tim and Fred decided to set off for the North Pole. Alison gave us a fond farewell and shook hands in case we did not return from our wintry adventure in one piece. 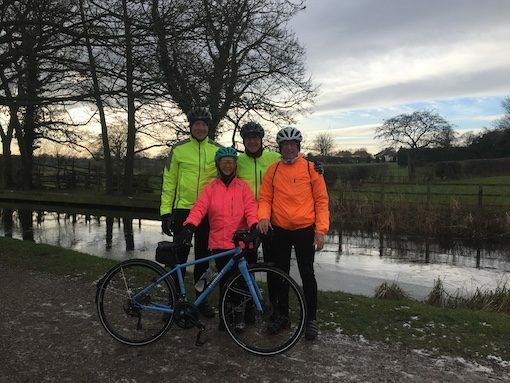 The four cyclists set off towards Knaresborough and gathered at the Low Bridge and decided it was safe to cycle along Abbey Road, it was quite clear just a few odd icy patches to avoid along with dogs and walkers. Tim had frozen hands and we had to clap in unison to warm him up. Up Chain Lane through to Boroughbridge Road turning left to Farnham. The plan was to take it steady look out for ice and decide at certain points the safest way to keep going if roads looked too icy. The sun was bright, it gave enough heat to melt the last remaining bits of ice, though road edges had to be avoided. Safely through Farnham, Staveley, Minskip to Broughbridge. The café in Broughbridge was quick with food but slow with drinks, Tim finished his teacake before the drinks arrived. Liz gave an hilarous account of her SAS adventures with helicopters and top secret documents. Mike said was it not SOS, Save our Soldiers!! Fred a new member was warned about Liz and hills, but said he was enjoying cycling with WE, not so sure now after his encounter with Mike and Liz!! And good times will return to you through your lucky Wooden Penny. Well it certain did bring us luck as we cycled through Littlethorpe, Bishop Monkton onwards to home. Fred carried on his way home to Knaresborough and the three of us turned towards Burton Leonard. The road was a wee bit icy sliding down to the ford. The ford had quite a lot of water and ice and it was best decided not to wade through it. The track up was very icy and despite skating a couple of times reached the road at the top safely. The tracks were now virtually free of ice but still had to watch out for patches. Along the Nidd road, down the Ripon road to Ripley and along the Greenway. Amazingly this was quite clear and dodging a few kids on wobbly bikes, dogs and walkers we arrived at Bilton Cross safely. Mike went to Starbeck, Tim to Claro Road and Liz to Bilton. 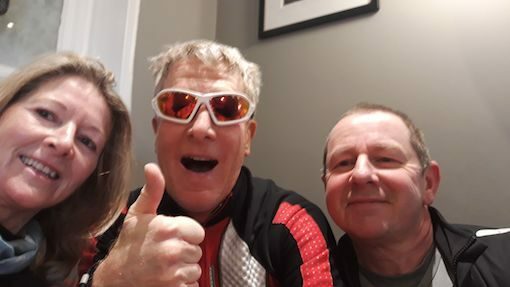 Mark T, Paul B and Julie decided to ride to Boroughbridge on the main roads to avoid the ice. This was a good strategy as the roads were surprisingly dry and traffic-free! Since the roads were so clear, we elected to continue to Thornton Bridge and on to our coffee stop in Easingwold. As we tucked in to our cheese scones and scrambled eggs, Dan arrived and joined us.